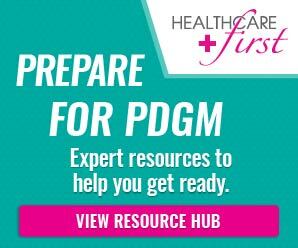 At last month's Home Care 100 gathering in Scottsdale, Arizona, CEOs and other executives from some of the largest home health agencies in the country took the stage to discuss their early planning process in preparation for the so-called PDGM payment system, set to take effect January 1, 2020. Stephan Rodgers, CEO, AccentCare, Inc., Brandon Ballew, CEO for the Home Health division of Kindred, and Marki Flannery, President and CEO of the Visiting Nurse Service of New York, took questions from their peers in the audience and from panel moderator Teresa Lee, Chief Government Affairs Officer and VP for the VNA Health Group, New Jersey. The discussion was lively; recommendations took on the tone of warnings. Mr. Rodgers assessed the difficulty of adapting to PDGM at "7 on a difficulty scale of 10." His organization is setting its sights now on what he calls "questionable encounters," which he described as visits or entire episodes where the clinical documentation does not demonstrate medical necessity and put the agency at risk for payment denials and fines. He is looking at beginning a pilot in a few of AccentCare's smaller locations toward the end of 2019. Ms. Flannery said the VNSNY is already seeing many 22-day discharges. "The problem is that we are getting a full episode payment now but will only get paid for 30 days when we get a patient better in 22 days next year. Asked how her clinical behavior might change, she asserted that it would not. "We already know the patient does better with front loaded visits," she said. Kindred's Ballew is looking forward to the new payment rules. "Right now," he explained, "they pay more for therapy and less for wound care. If you have a lot of patients with wounds, the change will help you take care of them better." He added his conviction that Kindred has been, and will continue to be, focused on what the patient needs first and only secondarily on what reimbursement will be. "If the patient still needs therapy, they should get therapy. The difference is how you deliver it and by whom." Expect to see more PTA and fewer PT visits next year. Under the new system, the OASIS assessment and diagnosis codes will determine which of six acuity categories the patient will fall into. Each category will have its own payment calculations and its own LUPA threshold, from as few as two to as many as six visits. Clinicians and billers will have to know where the threshold is for each patient. Rodgers commented that this means care plans will have to be completed immediately upon locking of the OASIS. Ms. Lee added that her sources pointed out to her that, in certain cases, it is possible that a patient's first 30-day episode could result in a LUPA, but the next 30 days could generate a full payment. Remember that it is only billing that will convert to 30-day episodes. One OASIS will still cover 60 days of care. AccentCare's Rodgers added that the industry should recognize that it "has not been too responsible" with regard to therapy. He forecasts about 20% less therapy next year. "Payers look at us as barriers to quality care for their beneficiaries. We have an opportunity here to become better partners." As an example, he reports having seen orthopedic organizations threatening to send Part B therapy services to patient homes instead of referring to home health. "Look at this as an opportunity to reconfigure ourselves to be more competitive players in the system," he urged. The panel had a few comments about the unpleasant prospect of receiving the highest payment rate for recently discharged patients but falling to a much lower rate for non-hospital-discharge episodes. While they agreed this makes economic sense for CMS as a payer -- patients coming straight home from the hospital typically need more care -- they object to having to take that cut for the second 30 days if the discharged patient needs more care. CMS will pay the second 30 days at the community rate, not the institutional rate, even if the second billing episode is contiguous with the first. "Most of the time, we are the reason those people do not go back into the hospital during those 60 days," Brandon Ballew said. "Essentially, we are being paid less if we do too good of a job and keep them at home for the full 60 days." To the extent that money drives behavior, it was not lost on the panelists that both the hospital and the home health agency come out better -- and the payer comes out worse -- if a patient is readmitted on day 31, stays for three days, and then returns to home care. No self-respecting home health agency would scheme that way, of course. Steve Rodgers: "Just because we're paid less, doesn't mean quality of care should decrease." All agreed that partnerships with large groups, both health systems and physician groups, will become more critical. Rodgers said he is reassessing marketing plans and sales compensation, looking at putting more emphasis on partnerships than one-off referrals. Ms. Marki may have uttered the most memorable line of the morning. "There are certainly opportunities here. We serve many more complex patients, those with complex wounds, chronic conditions, and multiple co-morbidities. These people have significant needs and so are more expensive to care for. Frankly, we lose our shirts on those cases because we provide the care they need, not the care we can get paid for. Now that there are higher payments coming for the most complex patients, maybe we will be losing only a couple of buttons instead of the whole shirt." As it often does, the discussion led to the question of how to get field staff to update their habits. Moderator Lee wanted to know what these executives plan to do to enforce standards of behavior on people who have been executing the same workflow for many years. "CMS," she added, "is afraid we will all learn how to keep revenue up however we can to compensate for the 6.42% cut they will impose under the assumption that we will make behavioral adjustments just to keep revenue up." Kindred's Ballew insists that his people will maintain the guiding principle, "what do patients need?" To ensure compliance, he will put "guard rails" around people. Ms. Flannery believes CMS assuming we will cheat is pure cynicism on their part. "We have made a significant investment in compliance," she insisted. Examine your coding practices; watch out for the tendency to elevate a secondary diagnosis code that pays better; it is a red flag every MAC, ZPIC, and RAC will be watching for. Upgrade your training; emphasize appropriate documentation. Your time frames will be compressed. You will not have time to volley an OASIS back and forth from clinician to QA nurse until they get it right. The field nurse must get it right the first time. Have checks in place. Never assume a great nurse will turn in great documentation every time. Look at how you are systematically bringing in your documentation, taking in signed orders, providing oversight. Learn data analytics now and use it to your advantage. You will need it next year. Know where your patients come from, know at all times where they are located, how you are taking care of them and whether your care plans are effective. It will be difficult for small organizations to invest in the data analytics to the extent required, particularly as we get into more complex nursing care. Consequently, the stress of the changes will hit the smallest agencies the hardest. Remote patient monitoring and virtual visits will help extend the reach of a too-small clinical workforce and small agencies will not easily bear that expense either, even if it does eventually result in a positive return. There will be two types of agencies that will fail, the ones unable to leverage the power of data analytics and the ones that have made themselves heavily dependent on the revenue that comes from therapy. There was a bit of disagreement here. Ballew is looking for merger and acquisition activity to remain at least at its current elevated level. Rodgers is not so sure, "Whenever we acquire an agency, there is always a temporary downturn before they start performing up to their previous potential. During a time of change and uncertainty, I see less interest in taking on a new acquisition and having to deal with their early struggles at the same time your entire operation is dealing with a new pay system." Mid-sized agencies are closer to their people and may be better positioned to manage change than either the tiny agencies or the national giants. Rodgers asserted that he has seen the most increase in sophistication in mid-sized agencies. "I am constantly amazed at the systems they are implementing, the innovations they try, and their ability to adapt," he said. Getting ready is your priority this year. Focus on the changes you need to make. Start training your people early. This is the latest step toward CMS's goal of putting beneficiary needs first and provider needs second, but it will not be the last.